As you grow older, your belongings grow with you as well. Besides the basic necessities, I have all these things spread around the house. I'm amazed that during the last 20 or so years since I started to earn my own money, how much properties I have accumulated. Piles and piles of clothing, shoes, books, magazines, cds, dvds. Some of the stuffs are hiding in the corner of the closet, some tend to form clutters around the house. I looked around and began to wonder, how much of these stuffs I truly treasure, what are the stuff that I would be taking with me if there was a fire in the house. I realized that, I still have just a shoebox of things. The shoebox may be a little bit bigger, like the one for boots. All the stuff I loved when I was a kid should still be in the box. Plus additional items from friends and family. That's it! I seem to have spent a lot and own a lot now, but in the end, only a shoebox of things is all I need to keep! 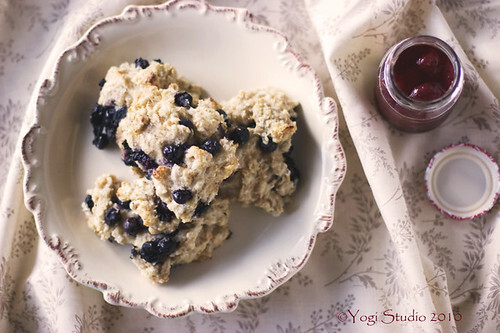 The blueberry scones I made today is quick, simple, and no fuss cooking. It's a drop scone and no shaping and cutting of the dough is required. I have been making this for several years and N doesn't seem to get tired of it. With the use of buttermilk, minimum amount of butter (2 oz) is required but the dough remains moist. I wish everyone will try this! 2 oz (1/4 cup) unsalted butter, chilled and cut into 1/2"
Sprinkle and toss 1/2 tbsp flour on blueberries and set aside. In a large bowl, whisk together flour, baking powder, sugar and salt. Spread cubes of butter on top. Cut in butter using a pastry blender until the butter pieces are coated with flour in pea sides and resemble crumbs. You can also do this step in a food processor. Just process the butter in flour in 5 to 10 one-second pulse. In another bowl, mix buttermilk with egg. Then add to flour mixture. Mix until just incorporated. Don't over mix the batter. Fold the blueberries into the batter. Be careful not to work it to hard because the blueberries can easily bruised. Original recipe uses only all purpose flour. As usual, I tried to incorporate as much whole wheat flour in baking as possible. And this is one of the recipes that it works. You can replace buttermilk with cream, of course. Or you can substitute buttermilk with 3 Tbsp buttermilk powder and 3/4 coup of water. Every summer I would freeze 2 or 3 bags of blueberries when they are at their peak. 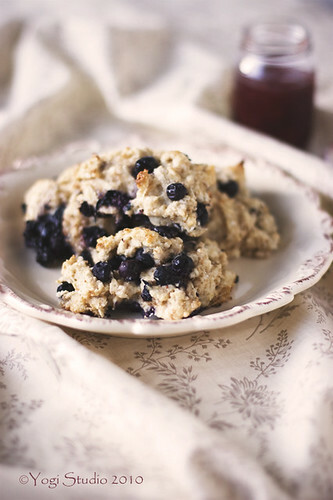 The scones taste the best when the blueberries are sweet and juicy. The original recipe is with orange glaze. I never made the glaze because I don't want the additional sugar. I think the scone is delicious just by itself. These look SO good and I love that they are drop! Jennifer - Thank you. "Drop" makes this a easy a quick recipe. I love them a lot too!